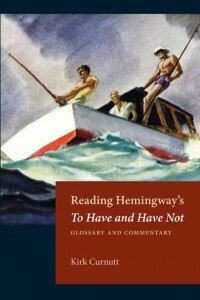 Published in 1937, Ernest Hemingway’s To Have and Have Not is that rare example of a novel whose cultural impact far outweighs its critical reputation. Long criticized for its fragmented form, its ham-fisted approach to politics, and its hard-boiled obsession with cojones, this blistering tale of a Florida Straits boat captain named Harry Morgan desperately trying to survive the economic ravages of the Great Depression by running rum and revolutionaries to Havana has fueled tourist industries in Key West and Cuba and has inspired at least three movie adaptations (including a classic cowritten by William Faulkner and starring Humphrey Bogart and Lauren Bacall). In Reading Hemingway’s To Have and Have Not, Kirk Curnutt explicates dozens of topics that arise from this controversial novel’s dense, tropical swelter of references and allusions. From Cuban politics to multifarious New Deal “alphabet agencies,” from rum running to human smuggling to byways, bars, and brothels, Curnutt delves deeply into the plot’s rich textural backdrop. Most important, he reminds us what a very different novel To Have and Have Not would have been had Hemingway not undergone a political change of heart while covering the Spanish Civil War and revised a narrative originally feral in its suspicion of partisans and ideologues at odds with the newfound ideals of activism and intervention that Hemingway felt essential to halting the global rise of fascism. AuthorKirk Curnutt is the author of fourteen books of fiction and criticism, including Ernest Hemingway and the Expatriate Modernist Movement (2000), Coffee with Hemingway (2007), and Key West Hemingway (2009, coedited with Gail D. Sinclair). A longtime board member of the Ernest Hemingway Foundation and Society, he is professor of English at Troy University in Montgomery, Alabama.